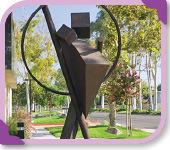 “Contained Energy” is located just outside the Cerritos Surgical Center, located on the northwest corner of Carmenita Rd. and 166th St. 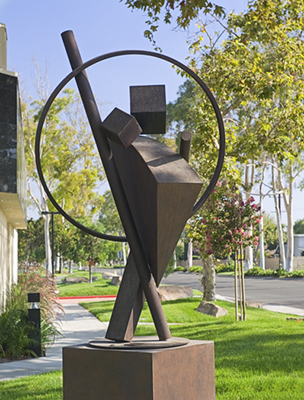 The hand-fabricated sculpture, created by artist Jon Seeman, is an abstract work made of welded hot-rolled steel and finished with a zinc enamel in a brown earth-tone finish. “Contained Energy” is 6 feet, 3 inches high, and sits on a steel base and a concrete pedestal.